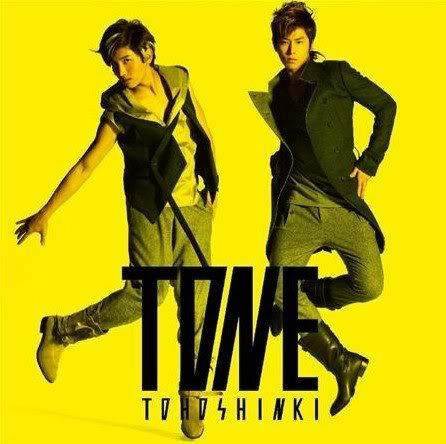 I really wanna know why Yunho looks like an Angry Bird doing the Irish jig on the yellow cover. All of TONE‘s covers are incredibly uninspired. They’re the covers you look at when you see them at the CD store (do these…still exist?) and you go, “…Okay.” And then you shrug before you put it back down and head on over to judge other CDs by their more awesome covers. The covers actually match perfectly with the content of the album — both bland and possibly a regression in style and execution compared to past works. 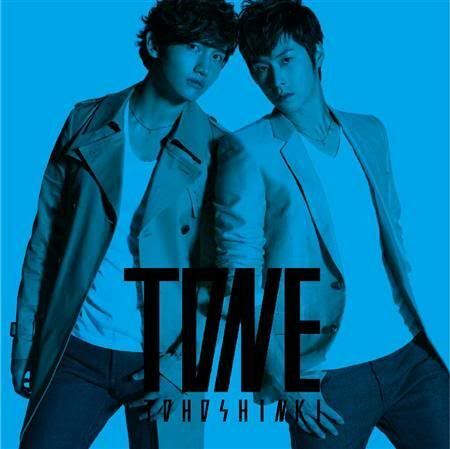 Tohoshinki’s past albums have always been a great mix of everything. There were the uptempo ballads, the downtempo ballads (I call them the ‘weepies’), the dance tracks, the tea-time melodies, the jazzy lounge tracks, the randomly intriguing pop songs that have a very distinct J-pop feel to them. They were all really unique in their own way and I would be incredibly happy as a listener because I got a little of everything. Of course there were the one or two throwaway weepies that I just did not care for at all, but they were the minority and they were usually on the second disc of the album or something (and this distinction between material from the first disc and the second disc is a big one). The songs on TONE sort of floated into each other and didn’t really differentiate much from each other. 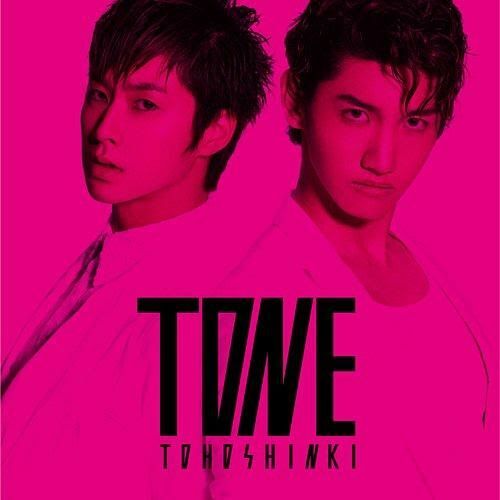 I felt that most of the songs on the album were a little too safe and way less creative than some of THSK’s past stuff. For example, Introduction ~magenta~ is pretty, but bland and never gets where I want the melody to go before it’s over. In fact, that the songs sound like filler material, with melodies that mostly don’t go anywhere is something I thought repeatedly as I listened to the songs. Not bad songs, just forgettable and sort of…there. I do love two songs: B.U.T. and Back to Tomorrow. I actually first heard Back to Tomorrow not knowing it was a THSK song when I was watching a Japanese commercial for a cosmetics brand. When the chorus of the song came on, I knew it was Changmin singing, and lo and behold, THSK’s credits appeared at the corner of the commercial. There is something striking about the way the duo sound, and the way the song builds up and builds up. It sounds sad and forceful, which is just how I like them ballads. As for B.U.T., I hadn’t expected to like this song because their dance tracks from the past year haven’t been that great. On a certain level, I blame it on how Yunho and Changmin sound together, with no other voices accompanying theirs’. I think everyone knows how problematic it is now, logistically, with HoMin because one is the highest voice of the group and one is the lowest voice. There’s no cushion between the two of them so you’ll always only hear Changmin when they’re harmonizing because the beauty of bass is that you can’t really hear it unless you’re listening for it, which is also why I appreciate Yunho as a singer, but that’s a tangent for another day. As for their dance tracks as of late, they’re not harmonizing so much as shouting, and I just freak out and can’t listen to them (see: Keep Your Head Down, I Don’t Know). I’ve never really had this complaint before — and I guess this is the nature of dividing lines between five singers as opposed to two — but Changmin’s voice is not that pleasant to listen to for lonnnnng stretches of time in hyper-intensive songs that require a lot of strong adlibbing and have a lot of chaotic noises built in. So the reason why B.U.T. is tolerable is because the song is a club banga, yo. Okay, not really, but it’s fun, it keeps you on your feet, and it doesn’t try so hard to be dramatic, which happens so often with DBSK’s Korean work…like they have something to prove, constantly. Everything about B.U.T. reminds me of Survivor — the feel of the music video, the lolzy choreography, and the way the song is essentially an earworm. The songs are not that good, but they seem to get better and better with each listen. I haven’t done an album review in a long time, but the reason why I had to review this was because I fully admit that I’m a nostalgic music listener. It takes me a long time to love new things, because I tend to cling on to older music that I love for a long time, and measure a lot of new things against their older counterparts. All of my favorite DBSK tracks are from their Japanese discography and I was hesitant to see how things would be with only two people fronting the group. I’m always wary when JYJ or HoMin!DBSK put out new material because I’m afraid their inability to keep the magic of DBSK going will mar the sentiments I have for their days as five. Truth be told, I’ve not loved a single song either groups have put out since their self-destructive lawsuit, but I did find some things I loved off Two Tone. Yet, I don’t feel triumphant as a fan to find new things to love, because it’s not the same. And I hate to be one of those grumpy fans that obnoxiously shout, “It’s just not the same!!! !” at everything and refuse to move on with the times, but…I got into K-pop because of DBSK, so my history with them as a fan is hugely sentimental. Obviously pop music isn’t that serious, but watching JYJ and HoMin feels not unlike watching divorced parents find companionship in other people after they separate. Like, great that they found happiness, but weird that they’re doing so separately when there were once such happy times. So I end up feeling nostalgic, bittersweet. Jaejoong’s voice isn’t middle tone though — he’s got the second highest voice out of the five. Junsu’s voice is high too, but he’s the middle register in the group. But I agree, JYJ got the “lucky” end of the stick in terms of vocal range–it’s not as extreme, there’s much more balance. I always thought yoochun sounded the lowest when he sings really deep..
I’ve been trying to find a description on what I feel towards the 5 members, but your description of divorced parents finding companionship with other people hits what I’ve been feeling for them as well. I had an image of a parent just observing the children grow(? ), even if you don’t agree with what they do, you just let them figure it out…yeah, but, I didn’t think really made sense, so yeah, your description was a good way of describing it. haha. Would you say you’re still a fan?